We spotted this blog from one of our registered businesses Evright.com who are based in Adelaide, Australia and thought we would share it. They are one of the leading Australian personalisation and engraving businesses and are also a distributor for our Premium Global Partner Trotec Laser. Have you been interested in purchasing your own laser engraving machine, whether for a hobby or to support your business operations? Evright was one of the first businesses in Australia to receive a machine in the late 1990’s and now is a proud distributor of the very laser machines we use onsite in our factory – Trotec Laser. 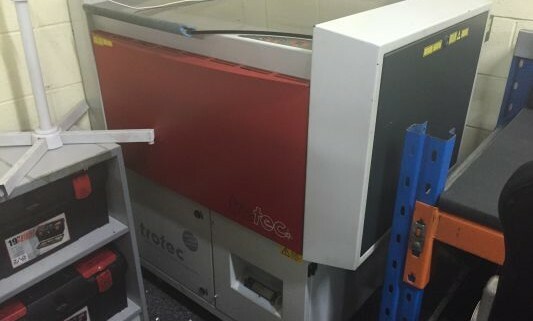 In fact, Trotec Laser is the global leader in laser engraving machine technology, supplying companies such as Apple, Nike, National Defence Forces through to RM Williams here in Adelaide. Evright offers customers the full range of Trotec Laser machines, from small desktop laser solutions (Rayjet), Speedy series laser machines, large laser cutters and galvo marking systems. In the next few weeks, we will showcase the range of Trotec Laser machines available through Evright.com, including benefits of each machine and materials. If you want to experience how a Trotec Laser solution can increase your business profitability or hobby, contact us on (08) 8231 2746 and we will arrange a personalised demonstration. 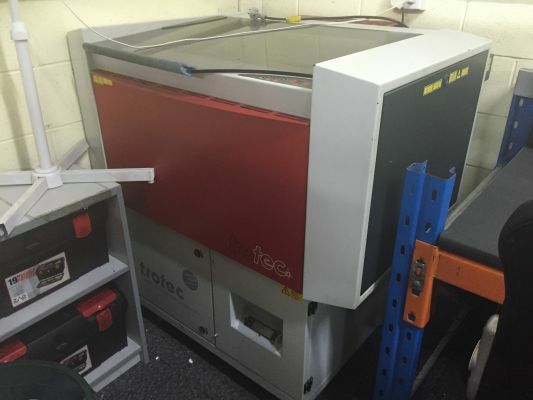 One of our original Trotec Laser machines – we can’t bear to let it go! It’s the fastest laser machine on the market by far – Increase your production efficiency by processing at a maximum speed of 3.55 m/sec and 5g. With the volumes of work going through our systems every day, Evright can personally vouch for the quality of Trotec Laser machines. One of the most popular Trotec Laser solutions for customers are the Speedy Flexx systems. Trotec first introduced flexx technology in 2005 and now there are hundreds of Trotec customers around the globe experiencing the power of Trotec’s flexx technology. Flexx technology means one laser machine with two laser sources – CO2 and fiber – which gives operators the ability to engrave, mark or cut virtually any material ranging from plastics or wood through to glass and metal, and even workpieces with mixed materials all in a single process. Use both laser sources in one job without having to change the laser tube, lenses or focus manually. Our Speedy 400 flex laser system – it gets a great workout! source gives the flexx the ideal advantage of being able to mark a variety of metallic surfaces. Every Speedy laser is ready for flexx so even if you already have a Speedy 300 CO2 or a Speedy 100 fiber these can be upgraded at any time to a flexx. The Speedy flexx is available in four models – Speedy 100, Speedy 300, Speedy 360 and Speedy 400. Click here for more information, or call us on 08 8231 2746 or email sales@evright.com to arrange your own personal demonstration.